Artistic beauty stretches as far as the eye can see on St. George Island. While Mother Nature has the landscape covered, the Sea Oats Gallery takes care of the inside. A sophisticated little gallery, the building found at 128 E. Pine Street creates a haven for local artists and those with inspiring talents. Showcasing one of the biggest establishments of artwork alongside the Forgotten Coast a peek inside is definitely refreshing. A variety of works created by artists and craftsmen living in St. George Island and nearby are expertly displayed. The talent upwards of eighty individuals are highlighted. Friendly faces and a casual atmosphere greet visitors as they come through the door. Many pieces focus on the allure of the sea and shadows of the sand. The ocean shares her bounty and several artists make their living energized by her offerings of sea glass, wood and other objects. The St. George Island property provides an excellent venue for artists to display and sell their work. Selections vary from vibrant scenes to subtle offerings. There is something to appealing to everyone. Treasures lurk around each corner and vary from paintings large and small to pottery and sculpture. Favorite faces draw folks in to see the latest creations. Whimsical watercolors by Joe Kortzman earn plenty of smiles. Glorious glassworks are formed by Susan Frisbee and Carol Nahoom. Talent comes through when working with wood and expert carver Joe Hutchinson’s birds are the talk of the town. Soothing seascapes are captured in acrylic and oils by Denise Choppin and Joy Estes. Brilliant photography by Drew Brass is even more captivating when placed in a reclaimed wood frame. Learn a little more about these talented individuals here. Workshops fill the calendar at the Sea Oats Gallery. Classes encourage creativity in all types of media. 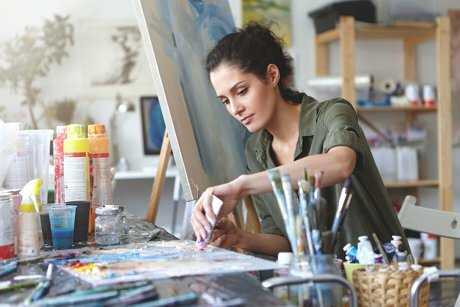 Painters learn various techniques in watercolor, oils, acrylics and collage. Crafting skills shared can feature sculpture, glass work, pottery and more. Take some time to embrace your inventive side. A visit to the gallery motivates and inspires.